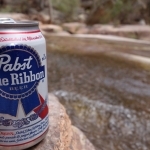 Pabst Blue Ribbon has been making beer for 175 years and to celebrate, they’re coming out with two new PBR brews. The brand with the cult-like following is known for their cheap beer and now they’re making one that’s booze-free and on the flip side, one that’s boozier. Get ready for PBR Non-Alcoholic and Pabst Blue Ribbon Extra, both of which are supposed to have the same taste fans love, but with different benefits. The “Extra” has 6.5% alcohol compared to the usual 4.7% and the cans are bold black. The non-alcoholic brew’s can also looks a little different, since it’s missing the original label’s iconic red sash behind its blue ribbon. And it’s got less than .5% alcohol, so sipping on these won’t leave you with a hangover (or any kind of a buzz to begin with). Both new PBR beers are in stores now and that should tide fans over until the new Pabst Blue Ribbon Whiskey arrives sometime in the future.